Super GT and DTM organizers have targeted joint exhibition races for as early as next year, leading into an end-of-season ‘finale’ event in 2020 for GT500-spec and DTM machinery under full Class One regulations. It comes amid continued talks between GT Association and the German-based ITR for its championships to feature common regulations, an initiative that’s been more than four years in the making. GTA chairman Masaaki Bandoh revealed prospects of two ‘inter-series’ races in 2019, one either at Fuji Speedway or Suzuka and the other likely in Hockenheim, that would possibly be tied around the season-openers for both series. While Bandoh said details are still “yet to be discussed” he indicated that GT500 cars would run under current regulations for the non-points events next year but be required to develop and run a different aero configuration for the races and the proposed ‘finale’ in 2020. Demonstration runs between the GT500-spec cars from Lexus, Nissan and Honda and DTM’s current three manufacturers, Audi, BMW and Mercedes-Benz, took place at both Hockenheim and Motegi last year, building towards Bandoh and ITR chairman Gerhard Berger’s goal of having fully unified regulations. Cultural and historical disparity, however, has hindered the convergence process, specifically with different paths taken on aero development. GT500 manufacturers have recently focused on development below the ‘design line’ while several new changes have been made to DTM machinery for this year, including the downscaling of the front ‘aero flicks’ and the elimination of the lateral duct panels and flicks at the lower end of the rear fender. DTM, meanwhile, wishes to freeze aero development for cost-reduction purposes, in the wake of a recent escalation involving Audi, which utilized former LMP1 aero engineers for its championship-winning Audi RS5 DTM car. Bandoh, speaking during the season-opening Super GT round at Okayama, indicated that all cars competing under Class One would be factory-backed, thus making it a complex situation. “I understand that those foreign manufacturers wish to reduce costs in their racing activities,” he said. “As Mercedes is pulling out from the DTM after the 2018 season, we shall use the next six months to develop the framework so Audi and BMW could participate once unified. Second Set of Bodywork for GT500 Cars? Bandoh said that Super GT would “maintain it’s own area of development” heading into 2020, although it’s already been determined that the ‘finale’ event would be held under a single set of regulations. It would thus require GT500 manufacturers to develop a second set of bodywork for the inter-series races in 2020 which fully conform to the Class One rules, while continue with developments of its own for its regular-season Super GT rounds. The “simple” aerodynamic parts have already been introduced into DTM this year. A similar concept would also be enforced on the engine front, with GT500 cars required to use the same specification powerplants as DTM. 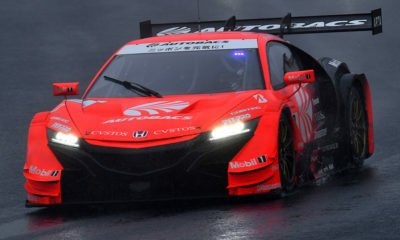 Bandoh indicated that Honda’s mid-engined NSX-GT, which confirms to Super GT regulations, will be eligible to compete in the proposed exhibition races next year, although it may be necessary for the Japanese manufacturer to develop a front-engined, rear-wheel drive car for 2020. Class One regulations prohibit mid-engined cars.